Manufacturer & Wholesaler of RFID Solution. Our product range also comprises of Barcode Printers, Barcode Scanners and Barcode Labels. RFID Solution enables you to advance your business to a new level of efficiency by providing greater visibility into your inventory as it moves through the supply chain. With real-time tracking information, you'll always know where your critical business assets are. Our comprehensive offering of RFID solutions helps our customers simplify deployments, lower costs and maximize return on investment. Earns high marks worldwide in the areas of connectivity, network security, and campus safety. Capture, connect, communicate and control critical information, more successfully, more efficiently and more cost effectively. RFID-enabled real-time information and asset management are changing the way organizations do business across all industries. 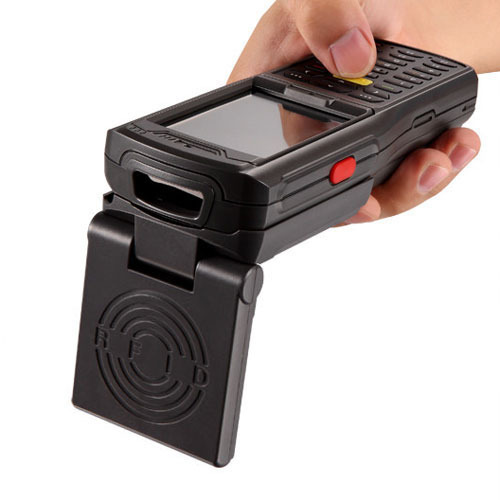 From the warehouse and loading dock to indoor customer-facing and carpeted environments, a mobile, handheld or fixed RFID reader can help you achieve maximum visibility into your enterprise assets. You can automatically identify, track and store inventory with RFID tags, and our RFID readers allow you to always be in control of your operations. Reduce cost and improve productivity with a broad range of RFID tags and labels – from consumable, low-cost RFID tags and labels for the item, case and pallet-level applications to rugged, high-performance RFID tags –built to withstand harsh environments and challenging surface applications helps to accurately identify and track your items. All that stands between you and RFID is ease. Simple to develop, simple to integrate, simple to use and manage — that’s RFID Software Solutions Platform (SSP) 1.0. Now, you can get on the fast track to deploying RFID with our standards-based APIs, handheld apps, and predefined reports, ready and out of the box. Plus, you can aggregate convenience with the modular and highly adaptable platform designed for multiple verticals, business applications, and devices. Consider it your way to offload complexity, thanks to SSP 1.0’s dependable performance that helps you capture higher returns at a faster rate and lower risk.